For the man who has everything… literally. Custom order and $3500 deposit required. Please contact BWL to request a custom order form. Final price will be based on options. We can walk you through the proses of Ordering this ring there are so many Options that every ring becomes a One of a kind Bill Believes this ring should only be made this way Photo has Blue sapphire stone 8mm synthetic Corundum made in Germany eyes of small skull”s with 2mm white Diamonds BWL stocks many Natural 2mm stones including Colored Diamonds gold parts a 18K yellow with Rose gold skid plate on back BWL has many one of a kind Natural stones in stock as well. Bill searches the world for the right stones and buys them Just for this ring. 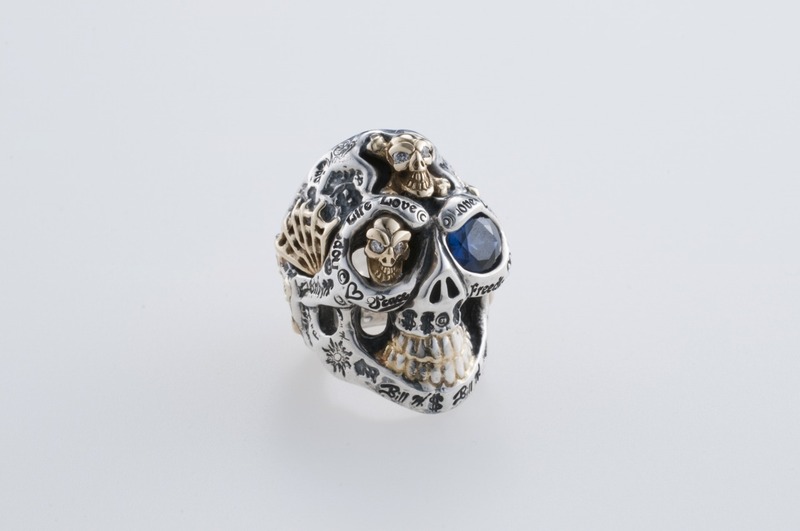 Based on your request Bill will email you stone Options and call you to make sure You get the true one of a kind ring All BWL Malibu Rings are custom-made to order and guaranteed to the grave. Limited edition products can be discontinued without notice.